directdaily: Parkinson’s Victoria "Skill Tester"
The slowness, rigidness and shaking limbs often associated with Parkinson’s Disease can make simple, everyday tasks virtually impossible. For non-sufferers it’s difficult to comprehend an existence where opening a carton of milk or using a telephone is an impossible task. They helped people experience this complete lack of physical control for themselves by filling arcade style skill-testers with everyday objects. 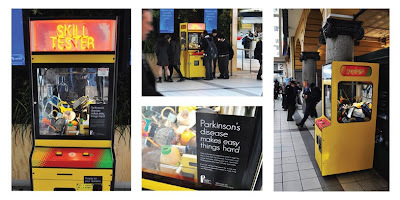 They then placed them around Melbourne, collecting $1 coins to fund help Parkinson’s Victoria’s research at the same time. In the first 12 hours over $5000 was collected.